Despite dealing largely with dramatic cinema, Peter Weir had the good fortune of working with two of the most gifted American comedians of this (or any) era. He drew out a defining performance from the late Robin Williams in Dead Poets Society, casting him as Professor John Keating not for the simple unconventionality of Williams in a “serious” role but more likely because Williams could convey passion in a way most actors of “serious” roles rarely can. Likewise, even though The Truman Show is pretty damn funny at times, Jim Carrey’s career in comedy matters little for his role as Truman Burbank — he’s perfect for it for another reason. I didn’t always think so. On first pass Truman seemed to have more tragedy in him than the actor was able (or willing) to provide, especially considering that Carrey’s Joel Barish from Eternal Sunshine of the Spotless Mind fought a similarly paranoid crusade and through it became a beautiful tragic hero for our modern age. In this retrospective light Truman seemed caught in the middle between Carrey the affable goof and Carrey the tragic everyman. And this younger version of Me was kind of bothered by the ending of The Truman Show, too. Like Network before it, Truman was a fantastic satire that took the growing media scrutiny/reality TV craze to an absurd extreme with a creeping plausibility. Unlike Network, though, Weir’s Show ended optimistically with Truman escaping his cage and presumably discovering the world. The ending is a classic moment of human triumph very characteristic of Weir, but it did feel like a darker conclusion might have driven the film’s modern commentary home with more force. This isn’t to say that Truman would be overall improved by a reworked resolution, but it would align it more with the prescient satire of Network. You might sense I’ve since come around (younger Me, of course, is now Me, older and slightly wiser — only slightly — and every bit as self-involved!) on both points, Carrey as Truman and Truman‘s ending. Doing this required observation of Christof, Ed Harris’s showrunner and de facto False God, in an altogether different light. It’s easy to say that Christof is the villain of The Truman Show. After all, he’s raised Truman in captivity for the entirety of his life. He’s also gone one further by never allowing Truman to even know that he’s in captivity, which basically makes him even worse than the architects in Cube. And finally, Christof seems willing to kill Truman for the sake of entertainment, hurling a fabricated hurricane at the little sailboat at the end of the film, responding to his studio network “superiors” (“We can’t let him die in front of a live audience!”) in exactly the kind of way a crazed artist would respond (“He was born in front of a live audience”). …and that’s without calling attention at all to Christof’s too-blatant name and his presiding over the world below (“Cue the sun!”) with utter authority. Those studio “superiors”? Their measure of control is a mere fraction of Christof’s. But that ending — there’s another angle to it, isn’t there? We never see Truman after he steps through that doorway, meaning we only imagine him gallivanting around the actual world, finally going to Fiji, finally seeing what everything is really like, maybe being disappointed from time to time but always better off than he was. But we never see Christof either, not after prompting Truman to “say something, goddammit!”, nothing at all after Truman gives his final bow. Even though he seems like a villain, there’s a small chance that Christof isn’t a villain at all by the end of the film. He continually preaches that the only reason the show exists at all is quite simply because Truman is Truman. Truman is “genuine”, he states, and while every other aspect of Seahaven is controlled Truman himself is not. “You never had a camera in my head,” Truman seethes from the threshold. Does it get more genuine than that? As Christof forlornly strokes the massive videoscreen of a sleeping Truman, isn’t he as trapped as his subject? He’s somewhat muted and more or less monotone through every speech in the film, even when riled by a former cast member of the show — except at his very last line, when he exclaims “talk to me…say something! Well, say something, goddammit, you’re on television! You’re live to the whole world!” Christof is brimming with pride at every step Truman takes, every wave he waves and every word he speaks — and at the end, in Truman’s most genuine moment, it’s hard not to believe that a part of Christof actually wants Truman to leave. Even if you disagree with that reading, I submit that this is still why Carrey is more perfect than some might realize for the role of Truman Burbank: he’s totally, refreshingly, daringly, unwaveringly genuine. Is this the slapstick Carrey of old? No. Is it the beautifully tragic Carrey of Eternal Sunshine? No. But it’s still a performance full of heart and verve, and that’s what Truman’s all about. 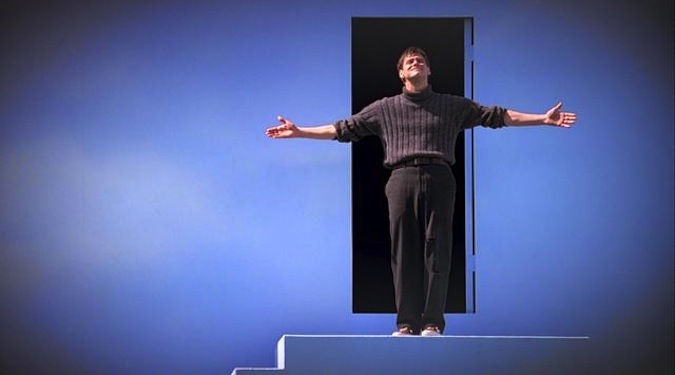 However you read it, The Truman Show remains one of Peter Weir’s very best films. Genuinely.